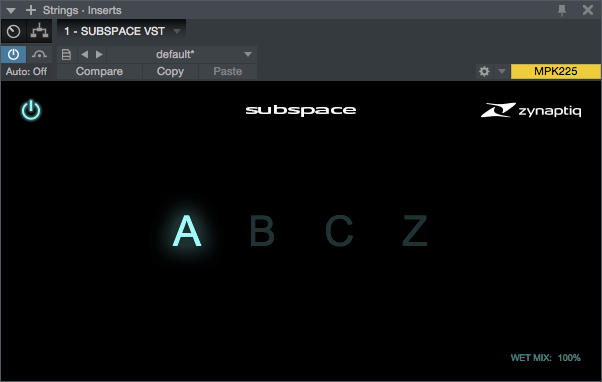 In this review I quickly want to share a cool new reverb plugin called "Subspace", made by Zynaptiq, a german company for audio plugins. You can grab this one for free, if you subscribe to their newsletter. Here is the link. CLICK HERE. As you see in the screenshot above, there aren't so many options to choose from and this is actually the really cool thing about this plugin. You don't need to set up hundreds of reverb parameters to make it sound awesome. You choose from the four parameters A, B, C and Z which reverb simulation you want and use the wet mix control at the bottom to add as much of the wet signal as you like. That's it! To use Subspace as effective as possible, try to use really dry source sounds. Either gate the sounds, so the recorded reverb is almost gone, or when you use virtual instruments, switch off the reverb of the instrument. What presets to choose and when? If you want to give a sound just a whiff of a felt space, use preset A. This one is a simulation of short early reflections, the first delays of a room / reverb. Insert Subspace as an insert effect – not a send. Now raise the wet signal by using the wet mix control at the bottom until you start to hear the "space". At this point it is too much, because we want to feel the space and not actually hear it. So now decrease the wet mix control a couple of percents back and you are good to go. I find that settings with preset A work best from 5-25% for myself. Of course you can use whatever you like. Don't forget to judge it in context of the whole mix. Preset B is as well a simulation of the early reflections, but now the simulated room is larger. In my opinion the range of the mix wet control is here a little bigger. You can go up to 40% and it's still sounds good and doesn't muddy up your mix. The first two presets A and B you can really use without cluttering up your mix, because there is no real reverb decay – only the early reflections. Preset C and Z are normal reverbs instead and give you the option to have them as send effects, as the decay time is long – C has around 4 seconds and Z has more than 15 seconds, basically never ending, no matter how far you turn down the mix wet control. You can use C for orchestral works definitely and Z for sound design purposes – like reversed reverb effects. Another cool feature you might not hear at first, is the hidden "tempo sync" for preset A and B. So if you change the tempo in your DAW, the presets change their early reflection times as well. Really nice! Your drums, violas or guitars groove with your song instantly! Basically that's it. Hopefully I could give you an useful overview about this little plugin and how you can implement this one in your productions. In the video below you can hear Subspace in action. I used Session Strings Pro from Native Instruments as the instrument. Enjoy! JLX from the other side!